Keep up with significant advances in the rapidly changing fields of nonprofit and public governance and change leadership and management. Transform your board into a truly high-impact governing body that makes a real difference in your organization. Build a rock-solid board-CEO Strategic Governing Team that can withstand the stresses and strains at the top over the long run. Incrementally fine-tune your board’s role, structure, and processes to ensure continued high-impact governing performance. 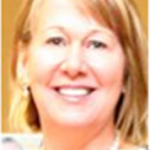 Take command of change, managing the high-stakes strategic issues facing your organization. Doug helped us transform a really good Spokane Transit Authority Board into an even stronger governing body. Doug’s approach…created a high degree of board ownership of the recommended new committee structure. Doug has helped…to clarify our organization’s strategic directions and its strategic change targets. Doug helped me and my Board Officers design and facilitate a really powerful daylong retreat. The “Meeting the Governing Challenge” workshop that Doug presented for AENC member CEOs was a real success, engaging participants and providing them with lots of practical guidance. Doug’s work with the NLEP Governance Task Force has yielded a powerful return in terms of high-impact governing. Doug’s work… has taken our Board’s leadership to the next higher-impact level. Doug’s presentation on leading change…excited and inspired the audience. Doug was a superb retreat facilitator — energizing and engaging participants while leaving them thoroughly satisfied. With Doug’s help, we’ve laid the foundation for a rock-solid Board-CEO partnership at the Miami Lighthouse for the Blind and Visually Impaired, Inc. The workshop Doug provided…was a real winner: substantive, insightful, and entertaining. Doug facilitated a really energizing retreat that kicked off our governance improvement effort. 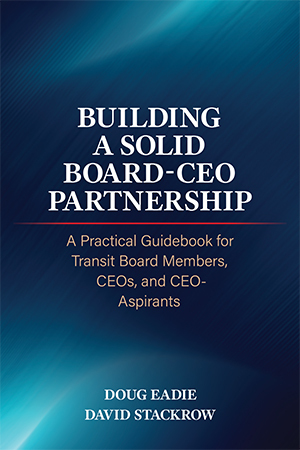 the first comprehensive, detailed description of the governing function in public transit written expressly for transit board members, chief executive officers, and senior executives…..
……you’ll want to keep Building a Solid Board-CEO Partnership close at hand, as a powerful resource you can draw on…..